It’s always shocking to me when I see an extremely sick cat, while the owner has not noticed any overt signs of illness. It just happened twice in the last couple of weeks. Paris, a 6 year old kitty, had a gigantic (benign) cyst on his liver. It was easily the size of both your fists, putting pressure on all of his belly organs. And Paula, a 12 year old cat, had a kiwi-sized cancerous tumor along her small intestine. In both cases, the first signs of sickness were noticed just 2 days before the surgery occurred! 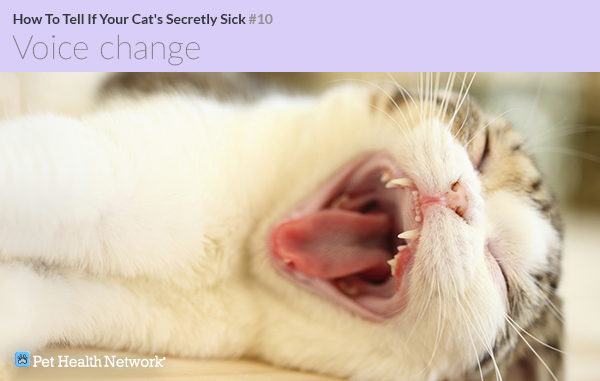 Let’s go over 10 common signs of illness in cats – although many of them also apply to dogs. Eating too much or too little can potentially signify disease. If you notice a change either way, you should notify your veterinarian. There are countless diseases that can cause overeating or losing one’s appetite. You veterinarian’s job will be to investigate why. This typically starts with blood work, X-rays and/or ultrasound. 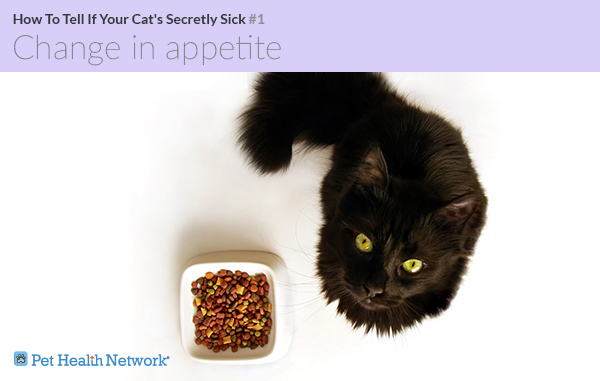 A foul odor coming from your kitty’s mouth can mean gum disease or tooth decay. Brushing your cat’s teeth is a good way to decrease those risks. Imagine if you went 5, 10 or 15 years without brushing your teeth! In addition, breath that smells like ammonia can be a sign of kidney disease. Causes of this annoying habit can be behavioral or indicate a disease. Discuss your pet’s symptoms with your veterinarian to rule out a bladder infection or urinary blockage before treating this as a behavior issue. Weight loss can be an indication of thyroid disease or worse, cancer. Weight gain or a growing belly can be related to various conditions such as pyometra (a uterus full of pus). Obesity by itself is detrimental to your pet’s health: it can lead to arthritis, tumors and a shorter lifespan. Lack of grooming can cause a dull or greasy hair coat, which can indicate skin disease or other problems. Some cats over-groom and end up with bald patches. Skin parasites, like fleas or mange, or even stress can cause this behavior. 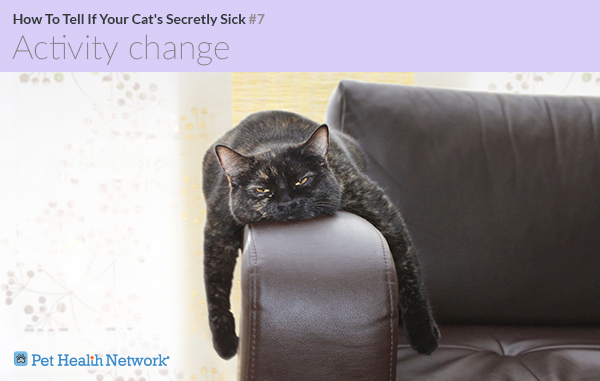 A change in your cat’s routine may be a sign of stress. 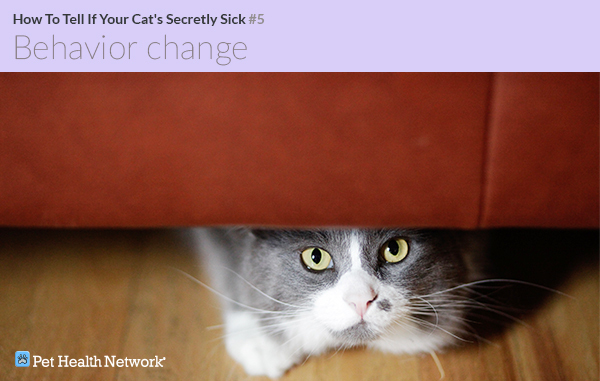 Changes in the environment your pet lives in, like the addition of another pet, remodeling or loud noises can all cause hiding, depression or a lack of appetite. Be objective and thorough when describing any potential changes to your veterinarian. Voice changes can actually indicate a problem. Normally quiet cats with an increase in vocalizations, or a usually chatty kitty which suddenly becomes quiet, might mean trouble. 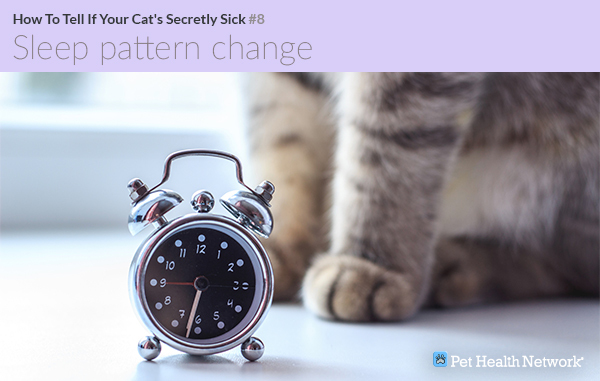 Any of the above changes, whether slow or quick, should be a reason to take your cat (or dog) to your vet to investigate the cause and find a treatment as soon as possible.